Growing out of a small town school event in California in 1978, Women’s History Month has been observed in March since 1987, when the U.S. Congress declared it. It is a celebration of women’s contributions to history, culture and society. The National Women’s History Alliance chooses a theme each year. The 2019 theme is Visionary Women: Champions of Peace and Nonviolence. These are women who have led efforts to end war, violence and injustice and pioneered the use of nonviolence to change our society. There have been women who have made a positive difference through peaceful protest and nonviolent actions for centuries. We have chosen a few of these amazing women to showcase from the mid 1800’s to the present. Susan B. Anthony was raised in the Quaker tradition of nonviolence and was influenced by her parents with a sense of independence and social justice. She was collecting anti-slavery petitions at the age of 17 and became the New York State agent for the American Anti-Slavery Society in 1856. After meeting fellow suffragist, Elizabeth Cady Stanton, the two women formed the New York State Temperance Society when Anthony was prevented from speaking at a temperance meeting due to her gender. They founded the Women’s Loyal National League to petition against slavery and later founded the National American Suffragette Association. Anthony was arrested in 1872 for voting as a woman in her home town of Rochester, New York which led to a highly publicized trial and a fine she refused to pay. Ultimately, it resulted in a grant by Congress in 1878 for an amendment giving women the right to vote. Anthony became known as the “Napoleon of Feminism” and is remembered today as one of the most historically significant advocates for women’s rights. American painter, illustrator, muralist and stained glass designer, Violet Oakley was the first American woman to receive a public mural commission. She is best known for the series of murals she completed for the Pennsylvania State Capital. Her political beliefs were shaped by William Penn, whose ideals she represented in her murals. When the United States refused to join the League of Nations after World War I, Violet traveled to Geneva, Switzerland where she spent three years drawing portraits of the League delegates and later published them as “The Law Triumphant: The Opening of the Book of the Law and the Miracle of Geneva” in 1932. She was an early advocate of nuclear disarmament following World War II. Oakley was the first woman elected to the National Society of Mural Painters. She received the Gold Medal of Honor of the Pennsylvania Academy of Fine Arts and was the first woman awarded the Gold Honor from the Architectural League of New York. In 1977, her studio in Philadelphia was listed in the National Registry of Historic Places in recognition of her artistry and beliefs. American born French entertainer, activist and French resistance agent, Josephine Baker resided and made her career in Europe. She was an icon of the Jazz Age and was noted for wearing a costume consisting of only a girdle of artificial bananas. Baker was the first women of color to earn international renown and to star in a major motion picture, Zouzou. She refused to perform for segregated audiences in the United States and was noted for her contributions to the civil rights movement. In 1968, she was offered the unofficial leadership of the movement by Coretta Scott King following the assassination of Martin Luther King, Jr., however she declined in order to protect her children. She received the French Croix de Guerre for aiding the French Resistance during WWII. 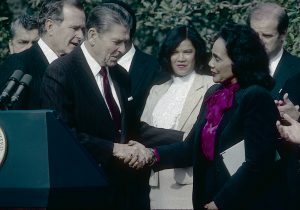 American author, activist, civil rights leader, and the wife of Martin Luther King, Jr., Coretta Scott King helped lead the civil rights movement in the 1960’s. She was an active advocate for African American equality. King was also a singer and often incorporated her music into her civil rights work. After her husband’s assassination, she took on the leadership of the struggle for racial equality herself and became active in the women’s movement. King founded the King Center and fought to make her husband’s birthday a national holiday. She broadened her scope to include apartheid and advocacy for LGBTQ rights. Rosa Louise McCauley Parks was an American activist in the civil rights movement best known for her pivotal role in the Montgomery Bus Boycott. The U.S. Congress has called her “the first lady of civil rights.” On December 1, 1955 in Montgomery, Alabama, Parks refused to give up her seat in the colored section of the bus to a white passenger after the white section was full. Her prominence in the community and willingness to become a controversial figure inspired the black community to boycott the Montgomery buses for over a year. Her act of defiance became an important symbol of the civil rights movement. Parks organized and collaborated with civil rights leaders. Shortly after the boycott, she moved to Detroit and did similar work there. She wrote her autobiography and continued to insist that the struggle for justice was not over. 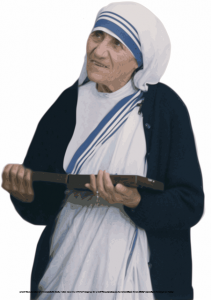 Mother Teresa Bojaxhiu was an Albanian-Indian Roman Catholic nun and missionary. In 1950, she founded the Missionaries of Charity, a Roman Catholic religious congregation which has over 4500 nuns and, as of 2012, has been active in 133 countries. It manages homes for people dying of HIV/AIDS, leprosy, and tuberculosis, soup kitchens, dispensaries and mobile clinics, children’s and family counseling programs, orphanages and schools. Members who take vows of chastity , poverty and obedience, also take a fourth vow “to give wholeheartedly free service to the poorest of the poor.” Mother Teresa received the Nobel Peace Prize in 1979 and was canonized as a Saint on September 4, 2017. Malala’s family ran a chain of schools in the region and she was inspired by her father’s thoughts and humanitarian work. She wrote a blog under a pseudonym for the BBC Urdu detailing her life during the Taliban occupation of Swat. The following summer, a New York Times documentary was made about her life as the Pakistani Military intervened in the area. On October 9, 2012, while on a bus after taking an exam, Malala and two other girls were shot by a Taliban gunman in an assassination attempt in retaliation for her activism. Malala was hit in the head and remained in critical condition in the hospital. She improved and survived, rallying to an international outpouring of support for her. The Taliban was internationally denounced by governments, human rights organizations and feminist groups. They responded by promising a second assassination attempt on Malala. After her recovery, she became a prominent activist for the right for education and established the Malala Fund, a nonprofit. 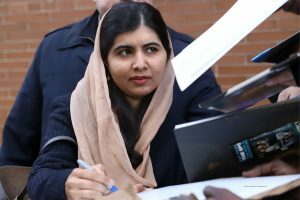 In 2013, she co-authored a book, “I am Malala,” an international best seller. In 2015, Time magazine put Malala on the cover as one of the most influential people global ly. From 2013-2017, she attended Edgbaston High School and is currently studying for her bachelor’s degree in Philosophy, Politics and Economics at Lady Margaret Hall in Oxford. There is no doubt that we will see more of her amazing efforts in the future. It is so important to become familiar with inspiring women during Women’s History Month, and every month. We urge all of you to take a few minutes to read about the many women who have either changed, or are changing, our world for the better in peaceful and nonviolent ways. Whether or not you agree with their interests and causes, they still have managed to become role models and achieve change. Share their stories with your children so they too can learn about these visionary women.